Last time we covered the first 9 Retouch tool modes. This week we will go over the remaining 10, the color adjusters. The Retouch tool is the pointy finger tool found half way down the Tool Palette. Select variations on the Tool Options Palette as with the other tools. Use the Color Retouch options when you want to adjust small areas of your image rather than applying a global effect such Hue Saturation and Lightness. The Color Retouch options work only on 24 bit, 16 million color images. 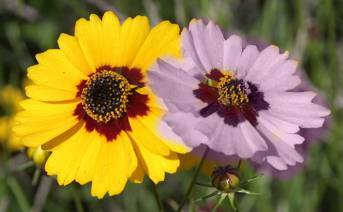 Right click on the flower photo on the left and save to your hard drive as Coreopsis.jpg. 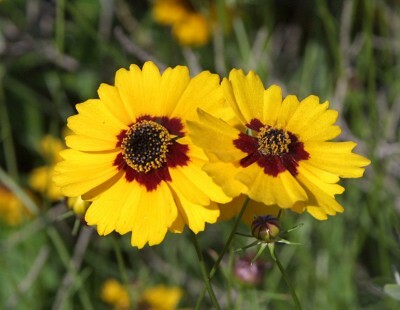 Open Coreopsis.jpg in PSP7 to use as the tester image for this lesson. Select the Retouch tool on the Tool Palette. On the Tool Options Palette, accessed by pressing the "o" key on the keyboard, pick the Saturation Up mode from the fly out list under the down arrow at the bottom. Saturation up increases the saturation value. Set the Shape to round, Size to 32 or so, Hardness to 0, Opacity to 100. See selection area on the image on the left. 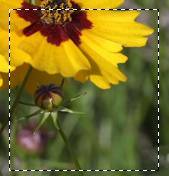 In the image paint over the area under the right flower and the grass. Note how the grass gets greener and the reds are enhanced in the buds and in the dim red bud deep in the grass. Also notice almost nothing happens to the yellow flower petals. Well how does PSP know to do this? To understand where the Tool takes us, pick a spot visually where the color changed a lot. 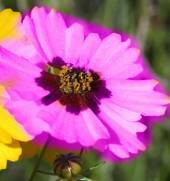 Such as in the grass, on the red area and on the flower petal. See the three circled areas on image on the left. UNDO the Saturation effect by pressing Ctrl + Z on the keyboard as many times as needed to undo. Select the Color Picker on the keyboard and click in the area, say, of the green grass leaves picking up a green foreground color. Click the foreground color swatch, which should be green, under the styles area opening the color palette. Note the greens position on the color wheel on the right indicated by the dropper. The HUE is indicated by the open circle on the outside ring. On the inside square, moving the open circle directly to the right all the way to the edge, would increase the saturation value of the color to 100 percent. Press OK to set that as the foreground color. Use the Retouch tool again going over that area of green where we originally picked up the color. Run the color picker over that area just painted and compare the color indicated on the RGB swatch on the color palette to the foreground color. Undo the retouching and try that same trick again on the red area under the bud as indicated by the dropper on the left. 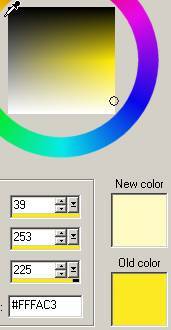 Pick up the color with the color picker. Open the color palette and type in the saturation at 255. Note what the color should look like with the saturation turned all the way up! Take the Retouch tool and paint over that bud area, noticing how the color builds up to the same color at 100 percent saturation. Last example for this mode. 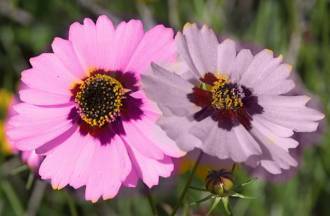 Pick a yellow color in the petal of the flower. Notice when you open the color palette that the saturation is already 250 +, in this case 253. Increasing the saturation increased to 255 doesn't make a lot of difference. In fact its so subtle it won't show up any differently, and the yellow in the flower won't alter when you paint over it with the Saturation Up mode. It stands to reason that the Saturation Up mode only works on those colors in the image that are not fully saturated. Gotta have room to grow those colors! Note: Control the amount of the saturation gain by raising and lowering the opacity on the options palette. Undo any changes to the image. Select the Retouch tool and use the Saturation Down option on the Tool Options Palette. Set the size to about 50. Opacity to 100. Paint over the yellow petals and some of the grass in the same area as before. 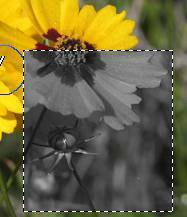 Go over the area a few times, noticing how how Saturation Down wants to pull the image to greyscale. 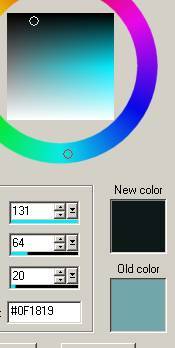 It's like picking a color on the color palette, then setting the saturation to 0 on the Color Dialog box. A shade of grey. That's all there is to the Saturation down. Control the effect by changing the opacity on the Options palette. Undo the Saturation down with the CTRL + Z keyboard combination. Choose the Lightness up option next. Set the size to about 50 and opacity to about 30. Paint over the area where I have the selection. Notice how the colors get lighter and whiter, the more you paint over them. See left. 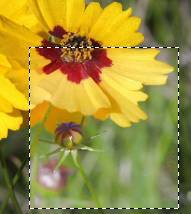 Use the Color Picker tool to set the foreground color to a bright yellow from the petals. Double click on its swatch to open the color palette. To see understand what lightness up does, note the position of the circle in the square. Type in a lightness value of 253, and notice where the circle moves. The color moves towards white as the lightness value increases. Hopefully you are getting a feel how the color picker works with respect to Hue Saturation and Lightness. UNDO any changes in the image. Select the Retouch tool and Lightness Down mode on the Tool Options Palette. Do a mental leap here. Guess what the effect of the tool will be then painting over an area using an opacity of 100. Lightness down darkens all the colors and eventually ends up jet black. Control both the lightness modes with the opacity slider on the Options palette. Undo, Undo, Undo till you get back to base image. Pick the Hue Up mode. 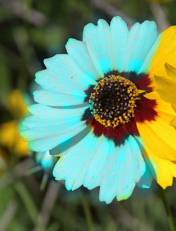 Opacity at 100 brush size around 50 and paint around the petals on one of the flowers. Neatness is not a issue. Note how the color goes green. Next pick the Hue Down mode, brush size around 50 opacity at 100. Paint around the petals on the other flower. Note how the color goes red. Why does PSP work that way. ??? With the dropper tool, if you don't already have the yellow petal color set as the foreground color, pick up a bright yellow found in the petals. 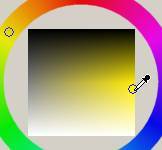 Open the color palette by clicking on the foreground color swatch and see where the open circle sits on the outer Hue ring as shown on left. 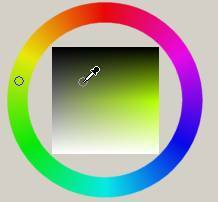 Click in the green you painted with the Hue up mode in the image and notice the circle indicating Hue on the Color Palette moves about 45 degrees more than the original hue. 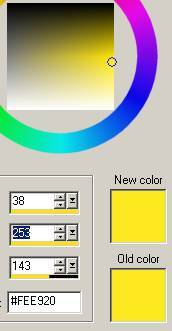 Click in the red where you painted with the Hue down and the ring moves to about 45 degrees less than the original yellow on the Hue Ring on the Color Palette. Undo the changes and select Saturation to Target from the Mode options area. This mode will match the saturation of the area you paint over with the saturation value of the foreground color without affecting the hue or lightness. 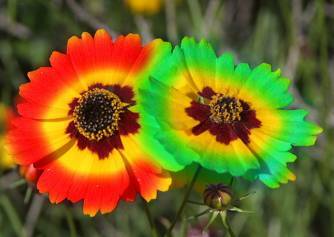 Let's say we want to match the saturation value in the flowers with the light green in the lower left corner of the image. 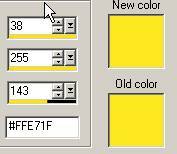 TRICK: Instead of switching to the Color Picker tool, with the Retouch tool selected press the Ctrl key on the keyboard and mouse over the image. The cursor changes to the color pickin' eyedropper, allowing you pick up the color without changing tools. Just hold the Ctrl Key and left click to set the foreground color. Using this technique, pick up the green color in the area shown on the left. Set the opacity on the Tool Options palette to 100. Roughly paint over the petals on the left hand flower. 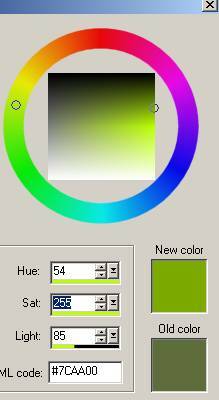 Notice how the color greys out to a dirty yeller to match the saturation of the green sample. 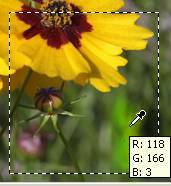 CTRL Click in the image on one of the bright yellow petals on the right flower to set the foreground color. 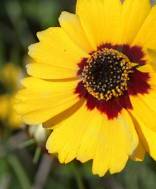 Paint over the dull yeller petals on the left flower which we de saturated in the last step. We can return the color (saturation) to very close the previous level. Remember changing the opacity on the Options palette controls the amount of the effect. The neat thing about Saturation to Target is the Hue and Lightness are not affected! The texture (supported by the lightness value) will not change. Pick Lightness to Target as the Retouch mode. As with the Saturation to Target, Lightness to Target only affects the lightness value of the painted over pixels, moving their lightness value to the lightness value of the foreground color. CTRL - click in a dark part of the green. Set the Opacity on the palette to 25. Paint over over the yellow flower on the left. Note how it goes pretty dark! Now set the color to the brightest yellow in the brightest petal. 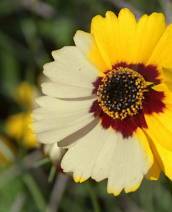 Paint over some of the darker yellow petals and watch them get lighter. Lightness to target wipes out the texture inherent in the area however! Be careful with it. On the color palette on the right side, pick a bright light blue for the foreground color. 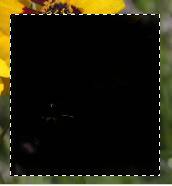 Set the opacity to 100 and paint over the yellow petals on the left hand flower. 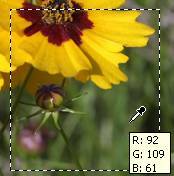 Now for grins, click on the foreground color swatch under styles and set the saturation on the blue color to 64 and the lightness to 20 by typing in the values. Paint over some petals on the right hand flower. UNDO all those changes, and pick the last mode, Color to Target. On the color picker palette pick a nice bright purpley red, like a hot magenta! 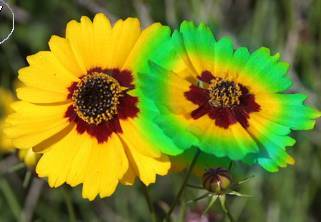 Set to opacity to 100 percent and paint the right flower. Wow! UNDO back to the base image. 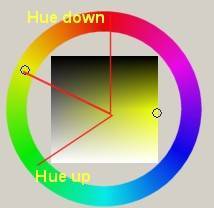 What is the difference between Hue to target and Color to target??? Remember that Hue only takes the hue of the color, not the lightness or the saturation. Color takes the Hue and the Saturation but not the lightness. With that same magenta color, click on the foreground color swatch, opening the color dialog box. Set the saturation to 50. 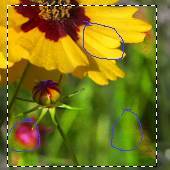 Using Color to target set to 100 opacity, paint the right hand flower. It goes kind of dull as shown on the left, but is the same color as on the foreground color swatch, minus the lightness value. Leaving the foreground color exactly the same, switch to the Hue to target mode at 100 percent opacity and paint the left flower. Notice the difference in color on the right and hue on the left. I hope this exercise illustrated how the color retouch modes work. Take it a step further on your own and practice making changes parts your photos or design projects using the Color Retouch Tool modes.